Lemonade! I love lemonade! Seriously if I could drink lemonade every time I'm thirsty...I'd be a happy girl. But unfortunately the calories hold me back. Not that lemonade is bad for you or loaded with an unusual amount of calories, it's just that a girl only has so many calories in a day and I have to draw the line somewhere. So I'm mostly a water drinker. But when I decide to indulge, or I'm pregnant and can't fight the craving, this recipe is my "go to". It's also great for holidays, parties, and book club dinners. This is what I served last week at our book club dinner, and I probably drank half of it myself! 1. If using fresh strawberries, wash and de-stem then place in a blender with ½ C. water. Blend into a fine puree. If using frozen strawberries, allow to slightly defrost. Then place in a blender and puree as above. 3. Discard the pulp and seeds. You should have about 1 ½ - 2 cups of strawberry juice that looks like this... Pure strawberry juice with out all those bitter seeds. 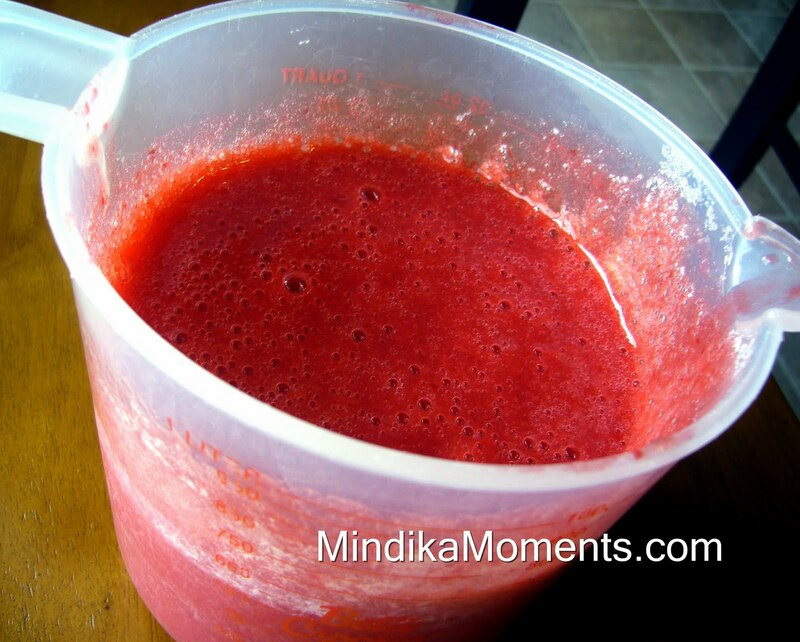 It's the most delicious strawberry juice or sauce you will ever taste. Pure goodness! 4. Mix up the pink lemonade according to the instructions on the can. 5. Right before serving, combine the pink lemonade, strawberry juice and soda. *You can make this with any variety of berry or fruit for that matter. I've made Raspberry, Blackberry, Kiwi, Mango and Mixed Berry. 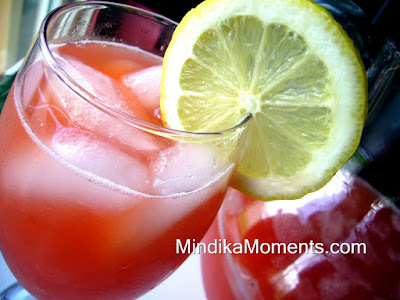 When I make the Kiwi and Mango I use regular lemonade instead of pink lemonade. I'd love to hear if you try another fun flavor. For a family event, I made a large container of lemonade. 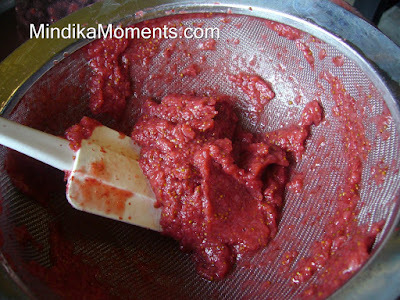 Then I made different separate fruit bases by taking frozen fruit, blending, and pushing the seeds through a strainer. Each person took a glass of lemonade and created their own drink by putting in a spoonful of raspberry, strawberry, or mixed berry. They had so much fun creating their own drinks ~ I love your kiwi and mango idea! That's such a good idea! I may have to steal for my next party. thanks for sharing.